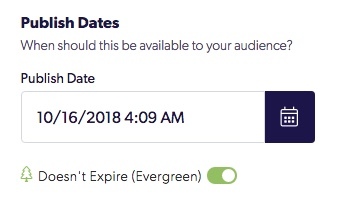 When you create content in Cerkl, publish dates let you choose the exact date and time your post becomes available to your audience (through their automated newsletters, Aptly & the Content Archive) as well as when it will no longer be available fo your audience. The default settings for the "Publish Start Date and Time" of your content is when you click "Publish" at the bottom of your story. If you have content that has a future release date, change the "Publish Start Date and Time" to match that release date. 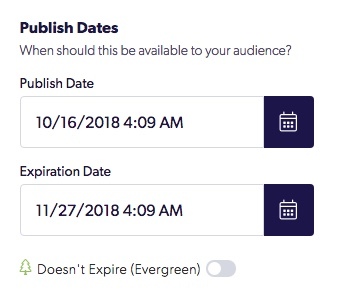 If you have content that should only be available to your audience for a specific amount of time, be sure to change the "Publish End Date and Time" to reflect your intended expiration date. Once your post expires, it's no longer available for delivery in future newsletters, searchable on the Content Archive or within Aptly. If your post will remain relevant & does not need an expiration date, simply toggle the Evergreen feature to the ON position. Pro Tip: Not to worry! We save all data and analytics for expired content within your Content Manager. You'll always be able to access those pertinent metrics by following the steps in this help desk article.